Become a beacon to your loyal fans . Popular cities for food trucks this week! At TruckSpotting, we are foodies that are also food truck fanatics. We love the al fresco dining experience on the go. The delicious yet fast and affordable dining experience that can only be found at a food truck. When traveling or moving to a new city we found a problem. We didn't know the lay of the land. While Google Maps is great at finding restaurants, it was useless at tracking food trucks. Thus our idea was born. We were going to outfit trucks with tracking devices and build an application that would allow anyone to find trucks near them. Hungry and lonely in a new city, we set out to fulfill our mission. How can you benefit from our hard labor you ask? Just download our iPhone or Android App. The app will show you a map with all the food trucks that are nearest to you. Don't forget to enable GPS location on the phone. If you want a list of the trucks, just click list on the bottom, the screen will let you filter by cuisine and sort by distance or rating. Once you select a truck you can see it's menu and schedule on the truck info page. Once you've fallen in love with either the food or the guy/gal behind the counter you can add the truck to your favorites and keep tabs on them wherever they may go. 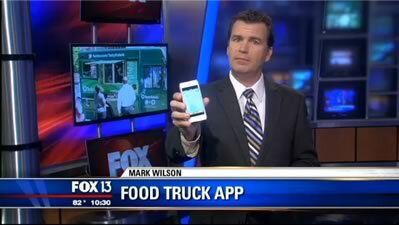 See Truck Spotting featured on Fox 13 news! Discover food trucks near you using our GPS food truck app! 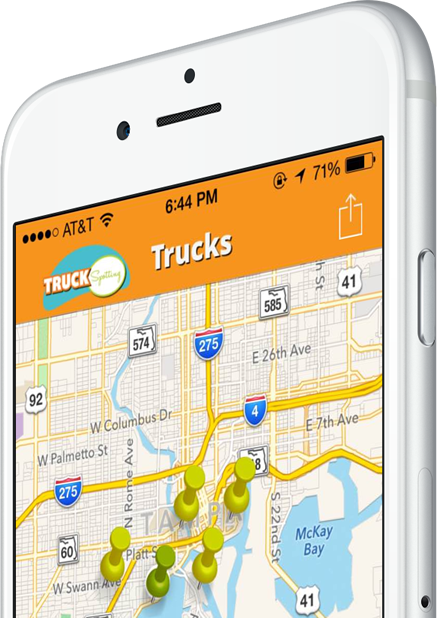 Grab the only real-time, accurate GPS based app to locate food trucks near you.